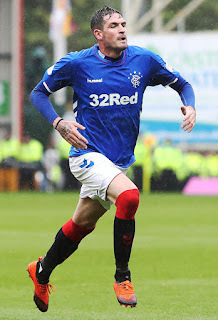 A number of key changes in the personnel yesterday stood out a mile, and we’ll cover them all today, but one of the most interesting ones was the complete ditching of Kyle Lafferty from the match day squad amidst signs that his second spell at Ibrox is becoming a totally busted flush. It started not badly – two goals v Motherwell in his full starting debut (he’d had a colourful cameo a week earlier as a sub v FC Ufa) showed signs of the old Kyle and the one we’d similarly signed from Hearts, but despite that huge goal in Spain, Lafferty dramatically faded from the front lines and has had to be content with being a substitute or less. In many senses it’s not his fault – we play Morelos up top and that’s our system – but when Stevie signed Defoe, the talk was about a pairing – the manager has shown no interest in that for Lafferty with the Colombian. He also didn’t help himself with an interview in which he admitted he didn’t mind if he didn’t play, as long as we won. It was a really good ‘team player’ comment to make, but his lack of assertion of demands that he play did suggest he would end up being relegated to the bench near-permanently. And that’s the way it’s panned out. In truth he’s not shown much consistency or form when he has played, and while mostly showing hard work and effort, has occasionally let himself down with a disinterested and vacant expression. We also know the legend of his high-maintenance persona, and how much work he is to others – he’s not a bad guy by any means but his baggage does go everywhere with him and it seems it’s followed him to Ibrox. Does he have a future with Rangers? As far as we can tell he’s happy to be here and play whatever role the manager has for him. He’s not pestering him to play Connor Goldson style and just gets on with his status at the club. We just don’t think he has much of one now. Bad news? We will need to find 2 strikers in the summer if Morelos goes, as I fear. 3 if Defoe doesn't work out. I did point out that Laffertys stats were never that good before we signed him for the second time. It was a bit of a panic buy as the window was closing because we had no other strikers to go with. Having said that I do think he has been very unlucky. If he had the game time I'm sure he could at least match the stats that he has produced previously. Rob, I know. I also made my views clear before we signed him. I will support him as long as he is with us and agree with you that he has not had a lot of opportunity. But I also feel if he was going to go on a scoring streak, he might have convinced SG before now. He has just proved everyone that didn`t want him back , right .We were told that he had grown up and he was a different guy now , but still he gets involved in too much off the field nonsense .On the field he has been a wee bit unlucky with some missed chances and disallowed goals but he just seems to foul all the time when he comes on .Trying too hard perhaps .He can still play his part if he knuckles down and concentrates on football .Expect him and Defoe to play against Cowdenbeath. I think Lafferty still has a future. The issue yesterday is that Gerrard wanted Defoe as a sub, and to be a direct replacement, allowing for the score in the match, for Morelos - they were never going to be played together. Of the three, the only one who can't play alongside another striker is Morelos. Lafferty and Defoe, as a pair, will and should get an outing dependent on the opposition. And I'd go further and play both at Cowdenbeath. Both Lafferty and Defoe need matches to gain/regain match sharpness and Wednesday would be perfect for that! I still rate Lafferty. He just hasn't had enough games. I think he is quicker and fitter than Defoe. Defoe looks as if he is running through tar when going for the ball. He just aint doing it for me at all, early days I suppose. El Buffalo is number 1, and rightly so,, but Lafferty is definitely my number 2. As a whole, I want consistency and a run of games to be in with a chance of the title. Agree. Lafferty has scored 4 goals with very little game time. Over a season, with the same limited game time, that could be 8 goals. So if he played almost every week he would surely be capable of 15 plus goals. Not terrible. Hope he gets his chance. I have little sympathy for Lafferty. I think he has absolutely taken the...this season. One minor injury and that has been him. Hal-a-player. When we saw clearly what he was like the season before. When he was banging them in for fun. Comes to us, falls to bits. Am sick and tired of it. I dunno, I think Lafferty still offers something different in terms of height and physicality and can play a part. He holds it up well and is decent off the ball. Wee bit unlucky with injury and perhaps not as sharp as he should be, but I'd still tip him for a dozen goals a season off the bench..